I’ve written a few times about historical research I’ve done looking into how U.S. student affairs professionals have used and viewed technology throughout the 20th century.Â Although I don’t know where my current job search will take me, I feel a responsibility to bring some closure to this research and then ensure it is somehow published or shared. 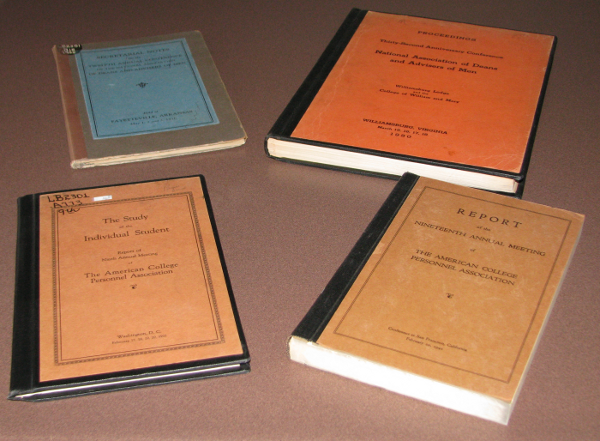 Much of my previous work was based on documents held at the National Student Affairs Archives at Bowling Green State University, especially the conference proceedings and programs for ACPA and NASPA.Â My work is incomplete, however, because those (wonderful!) archives did not have most of the conference proceedings from the first half of the century.Â However, another scholar told me that my own institution, Indiana University, has many of these proceedings.Â Since I will probably be leaving Bloomington soon, I finally followed up on this tip and requested all of the conference proceedings in the IU library.Â The two collections – IU and BGSU – complement each other very nicely, almost as if a single collection of all of the proceedings were divided evenly between the two libraries.Â It would probably be a bibliographic faux pas to ask one of these libraries to donate their materials to the other one but it sure would be nice to have a nearly complete collection in one place.Â At least the two universities are only a few hours apart so it’s not terribly burdensome for scholars who want to consult these materials. You can also improve your mind and learn how to be a dean by going to the Recording Room, just off the lobby, at any time that suits your convenience, and asking the attendants there to hook you up to one of the tape recordings that we have been busy making last night and this morning. We are conducting there an interesting new experiment in convention technique. On each of several topics we have had a team of five deans record their experience and advice — all on the same tape. Anyone interested in these topics can pull up a chair, light a cigar, and listen at leisure to the advice of five colleagues who could not otherwise be interviewed so conveniently. He can then add his own comments by flipping a switch and talking. Furthermore, six months from now when you may have to educate a faculty committee on the facts of life about one of these topics, you will be able to write Fred Turner for the recording, borrow a machine, and bring these expert witnesses into your committee room. Even though I’ve just begun reading through these proceedings, I already have examples of (a) worry about the effects of technology on education and students, (b) discussions of the potential benefits of technology in student affairs administration, especially record keeping and processing, (c) demonstrations of new technology by vendors and pioneering institutions, and (d) innovative uses of technology initiated by members of the professional organizations themselves.Â A history of regular and continued use of technology, including original innovations and cutting-edge uses, doesn’t seem to be part of the mainstream historical narrative of the student affairs profession but that seems to be the story I’m finding in the historical artifacts.